7.27 points at 11 votes (rank 271). London in the seventies. Reports about attacks on the population from oversized rats which cause panic in the city increase. An unknown quickly terminal disease that is passed on by a bite from the animals mystify the local medics. Only when the death news take over, the government decides to get active and puts together a team that is supposed to find the cause and a concept to overcome the crisis. But the situation gets out of control when suddenly millions of rats surge from the sewers everywhere and turn the town into a slaughterhouse. The disaster takes its course. The Rats is a mixture of a real-time strategy game and multiple choice horror adventure. 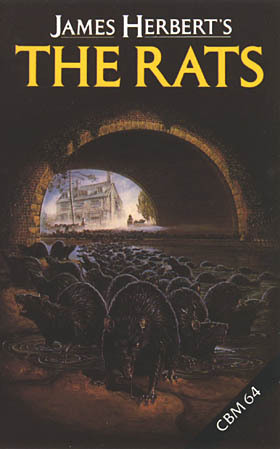 The player takes over the role of Harris, the leader of the rat fighting commission. His task is to win the war against the rats by a tactically clever use of the few ressources. This contains the sending out of action teams that smoke out the detected nests of the rats and the leading of the research department that needs information to develop the suitable antidote. The strategical map is the core of the strategy part. One of the possible adventure situations into which you get during the course of the game. The game is interrupted at regular intervals by adventure interludes. Here you play an inhabitant of London (e.g. Lucy, the paper deliverer or Henry, the shopkeeper) who is directly confronted with the rat threat and now gets into a life-threatening situation. With the right choice of actions that are presented in a multiple choice method, this character needs to be brought into safety. These interludes are also played in real time so that too long a hesitation can end deadly. The Rats has very spartan graphics in the icon style which is reduced only to the most necessary. The joystick controls are a bit cumbersome to get from one screen to the next, which especially stands out painfully being permanently under time pressure. It happens quickly that you haven choosen the wrong point and by this lost valuable time. The adventure parts are simple multiple choice issues, in return they stand out more by their scary situations into which you get and by the texts that do not stop at the description of explicit violence. There are many gimmicks contained in this game, starting with the teletype messages that constantly come in over the siren that announces the adventures to the many graphical and sound technical shock effects. If e.g. a character is bore down by the rats, the text display suddenly rips open and a huge rat sprite jumps at you, followed by a horror-stricken, screaming face of the victim. At a different place even animated blood splashes over the text! The sounds are also remarkable: you can hear how the rats nibble their way through the barricades, how the monster rats hiss and snarl threatingly or how rusty hinges creak. All that always accompanied by the omnipresent pounding heart. The war against the rats is always done from a strategic map that shows the area of London and the surroundings. Swarms of rats are shown as white squares that start at a random location on the map. These swarms will spawn and try to break out of the town's belt. If they make it, the game is over, because then the whole of England will fall prey to the plague. This part of the game runs in real time, whereby one second corresponds mostly to a real hour. If you stay inactive the rats will quickly spawn and spread into the direction of the border of the map until it is too late. With this you can get eyewitness reports concerning the type and size of the rats that were met. Big swarms or swarms with black monster rats need a big well-equipped team or specialised personal. Swarms with giant rats signal a higher need for action. With this command you send a destruction team to a field where the rats have spread. For the control you have available personal from the police, the London fire brigade as well as experts that are specialised in rat control. At first, you only have few staff, but the more the crisis escalates, the more additional staff will be sent for. In this you need to be aware that the fire brigade and the police are only equipped with insufficient or improvised weapons for the fight against this threat, so the fire bridge for example has only axes and high pressure nozzles. In the later course the British Army is called in to get the catastrophe under control. This group consists of a team of specialists, 3 police divisions and 2 fire brigade units. At the right you see the ones that are left. Equipment of the teams: From toxic gas over protective clothing and firearms to police dogs is everything available to a limited degree. Depending on the size and type of the rats that are reported you can send up to three teams from each category after having equipped them with the option "equip". There is a limited amount of equipment of each type. The more well-equipped teams you will send out, the bigger is the chance that they are successful. Too small or badly equipped teams often do not return from their operation. Furthermore, you need to consider that equipment that has been lost during an operation cannot be substituted. Unequipped teams suffer horrible losses. New units are shown in yellow on the map. Units that are in a fight with the rats are shown in red. Red units instantly need to be filled up or removed before they get destroyed. Two swarms of rats try to break out of the northern border of the map. This was successful with only a few own losses. The units let you know through a report whether they were successful. As long as you look at the map, the time is running, so that you quickly need to put up more units or swap them, and get in new messages. All that takes place in such a speed, that you need to be highly concentrated to not lose track of everything. Over "Research" you access the research centre which is divided into four different areas. You can distribute 10 research teams to these four areas. The more teams are allocated to an area the earlier will results be achieved which can in turn help the other areas and have influence on the course of the game. Also, observations from citizens from the adventure parts can give information. Each microscope is for one team of researchers. Researches the causes and background of the rat invasion. Collects general information about rats, e.g. how they communicate with each other and about the deadly virus that they spread. Develops effective weapons as nerve gas, killer virusses or flame throwers on the basis of the information from Origin and Nature and from hints from the population. Develops effective defense measures and methods for tracing as electric fences or ultrasonic interference machines on the basis of the information from Origin and Nature and from hints from the population. 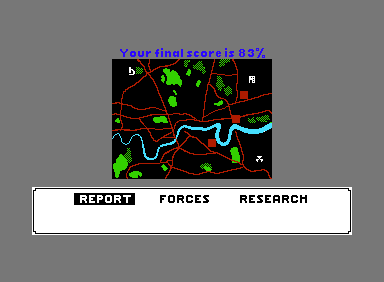 When a department achieves a breakthrough, the player is informed about this by a ticker in telex style running over the map. The strategy parts is interrupted again and again by short adventure intermezzos, which are announced acoustically by a siren wail. Here you play different characters that get into more and more dangerous situations the longer the game runs. At the beginning of the game it is relatively easy to escape the scenarios alive, you really have to act very carelessly, but this changes soon. The adventures are also played in real time. A dramatic pounding of the heart in the background gives information about the grade of threat of the situation, the more critical the situation is, the faster is the heartbeat. The possible actions are shown at the left border and can again be chosen by joystick, so there is no need to enter text. In this scenario a mother fights for her baby's life. Due to the time pressure you are forced to react quickly, which can lead to precipitious decisions. As an additional leverage the text is quickly made unreadable by interspersion of graphics in especially dangerous situations to let more hectic arise. Some scenarios have several possibility for a solution while others can only be solved safely in one way. The success of some action depends on coincidence, others in turn are scripted and depend on the exact point of time. It is important to lead the people in these intermezzos so that on the one hand they can get information about the rats, but on the other hand do not get into such a great danger that they lose their life. All the gained insights are given to the research departments in the strategy part, who can then draw conclusions from them. Every now and then you even play Harris the head of the rat control department. You MUST lead him alive out of the threat, otherwise the game ends prematurely. In the first half of the game, two of the three adventure sequences are randomly chosen from a pool of altogether four possible scenarios. The games has innately a bug: In the second adventure in the role of Henry the shop owner, if you stay in the anteroom too long, the game crashes. A bug that was already noticed by the testers of the Zzap64 at that time. At the start of the game, allocate each four scientists to the areas "Origin" and "Nature". The two others on "Offense" and "Defense". Right after the second adventure part, turn around this distribution. Instantly catch the swarms of rats that get close to the border of the map with task forces. Choosing REPORT before and after an operation raises the chances of success, same as the use of big and fully equipped forces. Whether the game is ended prematurely depends on several factors as e.g. the number of rats at the border of the map, the number of successful operations and the ressources left as well as the number of survived adventures. Almost all characters in the adventures need to be brought into direct contact with the rats and then brought into safety, to be able to gain any insights that speed up the research. In case of Keogh, however, this means that you need to let him get bitten and let him die from the consequences of the rat bite. As Henry the shop owner, instantly go into the cellar and take fligh through the sewers. As Harris on the cemetery, wait until the colleague has been eaten by the rats, then pick up the cage, put the chewing rat from the open grave inside it, pick up the car keys and then clear out before the cemetery gets completely overrun. In the underground station flee into the attendant's hut and hide in the closet. The episode with the bar seems to be a preprogrammed death trap: you'd best leave immediately. In the cinema go to the toilet during the movie and escape through the window. In the laboratory put on the protective suit and make chloric gas. Later adventures can - depending on the location on the map - even get impossible when rats have already spread too much. Robotron2084: "When I stumbled upon The Rats for the first time on a Sunday afternoon, somewhen in approx. 1986, I was instantly fascinated by this mixture of horror adventure and strategy game, if not even shocked (I was 15!). Nowadays, the happening on the screen seems of course rather tame, but at that time it was next to Friday the 13th the absolute splatter shocker on the C64. The sounds and clever graphic effects in combination with the scary scenario and the sometimes really gross descriptions of the ways to die, create a feeling which you only hardly can escape. The game really comes near the book (which had already made the headlines 10 years before) and some passages are copied in the adventures really meticulously. Unfortunately, The Rats - as all other adventures - does not offer much after being played through once.. but until then you can find this chunk a hard nut to crack. And, being honest, late at night in the dark it still well and truly takes it out of me. Fans of this genre should absolutely take a look at it. 9 out of 10 points." The version of The Rats on GB64.com was brought from the original cassette to the disk format in a conjointly coordinated activity by members of the Lemon64 forum in 2006. Before that, there was no fully working crack version of the game for 20 years, only a freezer version from the 80s, that was restricted to the first side of the game. This page was last modified on 25 April 2016, at 20:03.